← IAAC: To Change Directors or Strengthen the Institutions? National wrestling is considered a Mongolian precious cultural heritage. It holds the Guinness World Record that involved 6,002 wrestlers during the largest Mongolian wrestling tournament which was organized on 17th September. 2011. Wrestlers have been entertaining the audience during all national holidays and ceremonies. The biggest ceremony is “Naadam” which is organized between the 10th and 13th of July every year. It has also been inscribed as an intangible heritage of humanity by UNESCO. Only during Naadam wrestlers are awarded state titles based on their achievements, starting from the round 5 out of 9 (10 rounds sometimes). A few of the titles which represent some powerful birds and animals have been awarded since 13th century. However, some changes were made for the law of national “Naadam” ceremony with regards of state titles in 2005. 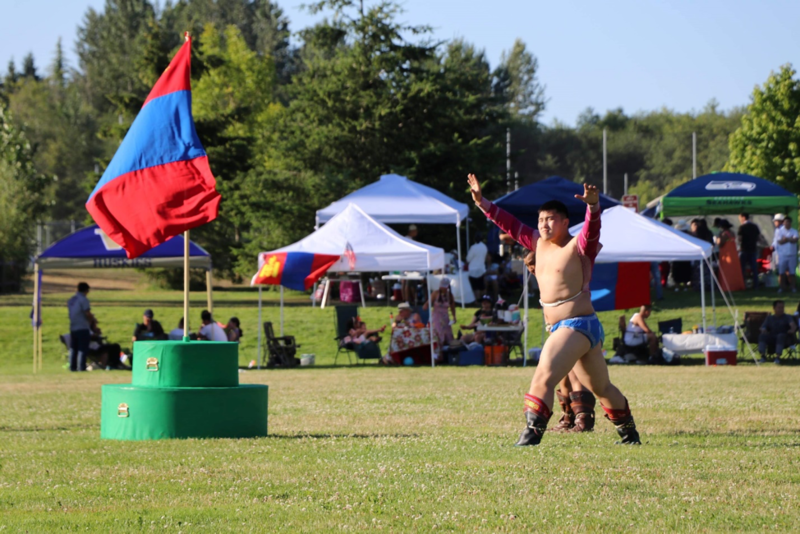 Puntsagdorj.T (Т.Пунцагдорж Аймгийн заан) “Naadam” 2018 Seattle, USA. After the result of 10th round Champion Аварга The Naadam with 10 rounds (1024 wrestlers) usually takes place 2 times in a decade when there is a special state anniversary. The highest two state titles are awarded immediately for a wrestler who wins round 9 or 10 no matter what kind of title he previously holds. In recent years, a bizarre practice has been occurring in Mongolian national wrestling culture. A wrestler who wins the “Naadam” wrestling tournament is awarded either the second highest state title (Арслан) or the highest (Аварга) depending on his current title, the wrestler is also given a higher rank of military title (like a bonus) such as lieutenant-colonel or colonel by the law enforcement authorities if he belongs to one of the sport clubs that are run by any law enforcement authority. This practice divides the audience into two sides. Many criticize that military titles should not be awarded as prizes, especially for the wrestlers who do not have any experience in the military while real military officers who work 20-30 years for the military sector retire without these titles. Others justify that reaching a higher level of state title is challenging, so they deserve it. Although there is a long list of names of wrestlers who have been awarded both military and wrestling titles at the same time in recent years, the sensation was not as serious as this year’s result. Surprisingly, N.Batsuuri, the of this year’s “Naadam” stirred a huge discussion among the audience. He was awarded the highest state title along with a lieutenant-colonel by the National Emergency Management Agency (NEMA) because he belongs to its sport club. Most critics blame Batsuuri rather than “NEMA”. If someone must be blamed, the target should be either a legal gap or the authority of the law enforcement authorities instead of an individual. Obviously, he did not award that military title for himself. Many claim that the only reason why Batsuuri is being blamed and criticized by many people is that he was born and raised in the western part of Mongolia, in Uvs aimag where about 3% of Mongolian population hails from. Discriminating each other by ethnicity is regretfully common in Mongolia, in all arenas including politics and sports. It is uncertain that when and who is going to eliminate the attitude among the citizens of Mongolia to discriminate each other by his or her ethnicity that has been continuing since 14th century. It is regretful and painful to see such an ethnic discrimination in a small country. The problematic practices in wrestling do not end with these issues of military titles and ethnic discrimination are not only the things that have to be resolved. There are other serious things such as buying/selling state titles of wrestling, prevalence of doping and associational rivalry which lead by politicians (former champions) between an old association (Үндэсний бөхийн холбоо) which ruled roughly 28 years and newly stablished association. Buying/selling the titles has become very common, especially it can be clearly seen during the round 5 for the lowest state title. Also, the two associations often announce that their purpose is to eliminate the negative images of national wrestling. However, associational rivalry is suspected that their main goal is merely to own the “Wrestling Palace” under the pretence of reform. Although, Mongolians would never get rid of national wrestling, all the negative images should be reformed as people enjoy any sport when there is no cheating. If the reform could be done as soon as possible, I strongly believe that the audience is not only measured by Mongolians, it has the power to attract international audience, like Sumo in Japan. PS: Every Mongolian is looking forward to Naadam. Every man of all generation wrestles as a kid for fun and play. I (accidentally) won the wrestling championship of the BC Mongolians Community Naadam this year (4 rounds only and no title was awarded). This is to say that wrestling is a part of a cultural identity, therefore the matter of where it is heading is of a great concern to me. Bat-Erdene ZORIGTKHUU currently lives in Vancouver, Canada. He graduated from MUST and is aiming to complete a Master’s degree at Norman B. Keevil Institute of Mining Engineering of the University of British Columbia. Zorigtkhuu’ research will focus on Mining Local Procurement (Local Content) in Mongolia. Professional background: Zorigtkhuu worked for the biggest coal mining company (Energy-Resources) in Mongolia and an “International Medical Center (Intermed Hospital)” project that was jointly commissioned by MCS group in Mongolia. This entry was posted in Naadam, Wrestling, Zorigtkhuu Bat-Erdene. Bookmark the permalink.